This photo provided by The Coca-Cola Co. shows examples of Diet Coke's rebranding effort. 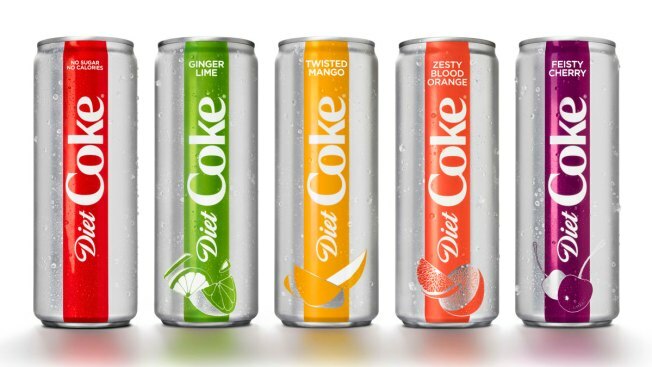 The Coca-Cola Co. says it is adding a slimmer 12-ounce Diet Coke can, refreshing the logo and offering the 35-year-old drink in four new flavors, including mango and ginger lime. The company said Diet Coke’s new look and flavors were aimed to appeal to millennials. Diet Coke is getting a makeover to try to invigorate the sugar-free soda's slumping sales. Coca-Cola said the new flavors and look — with a different color vertical stripe for each flavor and red for plain — are aimed at appealing to millennials. It spent two years on the makeover and tested more than 30 flavors before settling on the four, which also include cherry and blood orange.